Mom: So I was thinking we could meet at Seven Moons for dinner. Mom: Yes, it does! They have pad thai! I get that all the time! Me: Really? They don’t use fish sauce? Needless to say, it was all downhill from there. Mom called the restaurant, they confirmed that fish sauce is everywhere, and my poor mother suffered a severe case of disillusionment. I might have spied a tear on her cheek when she hung up the phone. Luckily, though, a quick Google search advised me of a promising but yet-untried (by me!) veg-friendly joint in Providence – Julians Restaurant. (And yes, there is a lack of apostrophe in their name. I know.) So, that evening, we all met up there to see what Julian had to offer. While Julians isn’t a vegetarian restaurant (the menu includes various meats), it does offer more than a few meat-free options. And we’re not talking about your token Boca burger, either – these are creative, thoughtful dishes worth ordering. All of my family members chose something meat-free (if not vegan), and I passed the camera around the table and had them photograph what they ate. We’ll start with the Vegan Steak & Cheese Wrap, which both S and I ordered because neither of us was terribly hungry. 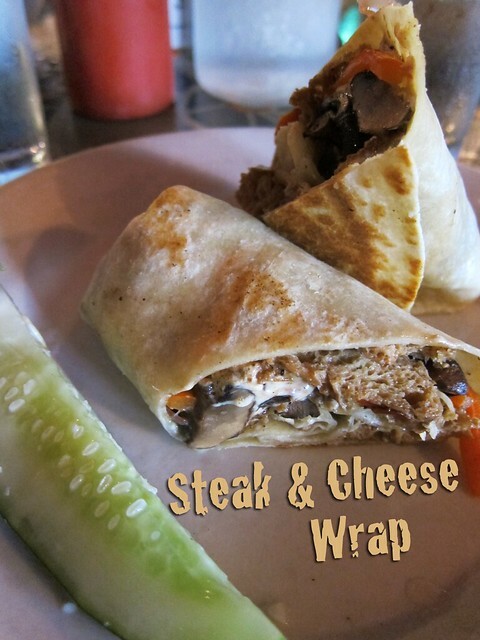 Our wraps included house-made seitan, onions, mushrooms, peppers, and vegan cheese, and they were the perfect size for our less robust appetites. The house-made seitan was juicy and tender and they included just the right amount of soy cheese. My only complaint was that the seitan was just a bit too salty for my tastes. After being foiled in her earlier craving for pad thai, Mom decided to go with a different flavor palette entirely. 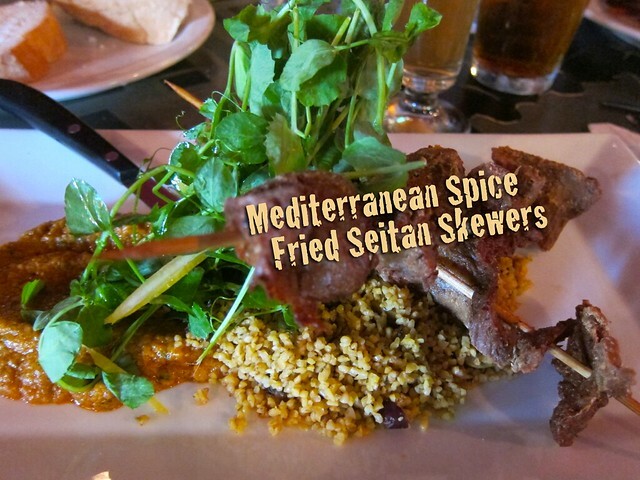 She ordered the Mediterranean Spice Fried Seitan Skewers. Fancy, right? These featured more house-made seitan alongside saffron-olive-portobella bulgar, pea tendrils, preserved lemon, and paprika roasted cauliflower purée. See what I mean about the creative dishes here? Mom enjoyed these, although she agreed that the seitan was a bit salty. Finally, here is the last dish that got photographed. I’m not sure if it was dad’s or my brother’s – I thought both of them had snapped a shot, but apparently not! I think this is my brother’s dish. 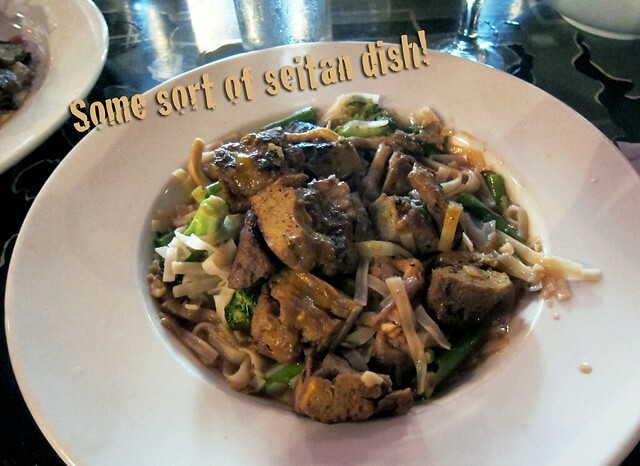 He chose a special of the day, which was a seitan-based dish in a spicy peanut sauce. He liked it but commented that it wasn’t really all that peanutty – the spiciness overpowered the peanuttiness. Alas. I’m not totally sure, but I believe my dad ordered the House Corned Beef Seitan, which is served with roasted fingerling potatoes, maple glazed carrots and caraway stout braised cabbage. He gave me a taste, and I can vouch that it was quite tasty. My sister ordered the only non-vegan meal, another special of the day. Hers was some sort of tofu-based sandwich; I think it included cheese. Have you spotted famous folks out and about in the wild? What’s your favorite local veg-friendly eatery? You know, I’ve never been to Julians, either! The only reason I haven’t gone is because my tummy doesn’t really like seitan, and their vegan menu is so seitan-heavy. Nevertheless, I do check their menu online all the time to see what they are offering. Those pancakes do sound delish! My favorite local veg-friendly eatery is 1149 Restaurant in Warwick. It’s actually a “regular” restaurant but they offer huge salads that are almost all vegan (surprisingly!). Plus they give you great breads to start. It’s a fancy place with great prices. Love it! Ooh, thanks for the tip on 1149! And yeah, Julians seems to be very seitan-heavy. My sister’s tofu-based sandwich was the only non-seitan item any of us ordered! Oh yes, definitely! Wildflour is amazing. I’ve sent omnis there and they’ve loved it!! And Garden Grille too. There’s not much in RI but at least we have these! Julians is that place where you always want to eat, but is expensive or crowded. Home to so many creative dishes, and such a colorful interior. A gem of the west end, and inspiration for yarn bombing that would match the exterior, although I’m not sure molly actually bombed as planned. Yeah, it was not cheap. Definitely worth a stop at some point, though! Oh, by the way: Have you been to Crazy Burger? It’s in Narragansett. It’s also colorful, creative, delicious, and at least a dozen vegan dishes that sound wonderful. http://www.crazyburger.com/#!